We've been sitting on this compilation way too long. 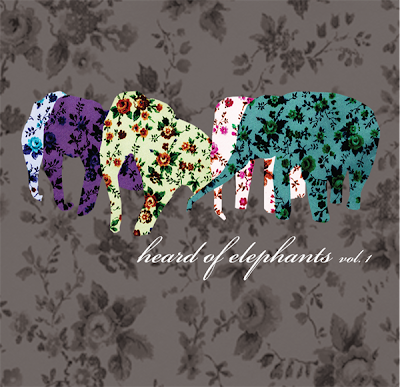 From the L.A. underground, comes the first compilation from the art and music collective Heard of Elephants. The music contained within this compilation draws from every genre, but focuses namely on noise, rock, and yes, even some jazz/punk fusion. Didn't know that existed right? I just made it up. It's awesome. HOE is a mash-up of everything. This is an extremely cool project and it's absolutely worth looking into. Vol. 1 contains something for everyone, from more accessible indie-rock and folk to more out-there experimental and ambient music. Heard of Elephants curates a monthly extravaganza and are currently in the midst of a residency at Hollywood's Unknown Theater. The shows house art, music, and installations, not to mention free beer and a generally festive atmosphere. Wish we could go. The bands included on this release are: Random Patterns, Charts and Maps, Danger Bees, Pride of Kenya, Semiconscious Gloria (name that movie anyone? ), and The Nocturnes. We admittedly never heard of any of these bands before this collection, but we're glad we have now. Things are brewing in L.A., and it's not all happening at the Smell. Brooklyn better watch its back. Pick up the compilation and get more info on the collective at their website.